Replacing the pull cord on a Toro lawn mower is a fairly simple process that requires only minimal knowledge of basic machinery. 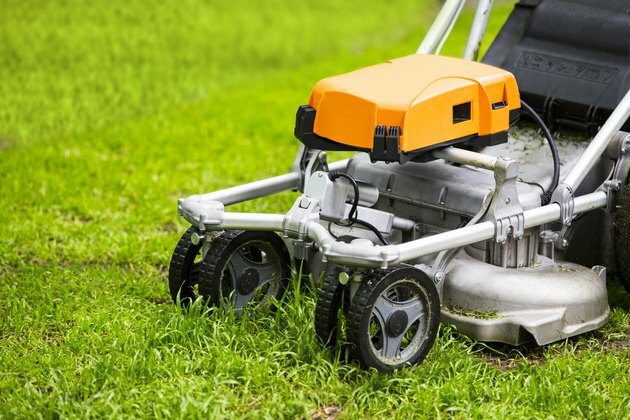 This is good news since the pull cord can get easily frayed through regular use and eventually break way before the mower itself needs to be replaced. Toro lawn mowers engines come with a removable recoil starter operated by a pull cord. Starting the engine by pulling the handle out at a slight angle creates friction between the pull cord and the hole it comes out of. This eventually can cause the cord to become frayed and break. Check your pull cord regularly and replace it at the first signs of wear. Remove the three or four bolts that hold the recoil starter to the engine housing and then lift off the recoil starter and turn it upside down. Hold the housing in one hand and use the other to pull the starter handle out until the cord is fully extended. This will line the cord up with the hole in the pulley. Hold the pulley in place with your thumb and then slip a screwdriver into the pulley and the outer housing to hold it in place. Dig out the broken cord with a screwdriver. Pull the knot on the inside of the pulley out with a pair of needle-nosed pliers and then cut through the cord with a utility knife. Discard the rest of the cord. Wind the center piece in the direction the pulley rotates during startup. Brace the pulley segments with your thumb while doing this. When the pulley won't turn any further, back it up until the hole in the pulley lines up with the pull cord hole. Slip a screwdriver through the pulley to hold it in place. Cut off a suitable length of braided nylon replacement pull cord. Melt the cut end with a match or cigarette lighter to prevent the cord from unraveling. Feed the replacement cord through the pull cord hole and the hole in the pulley. Pull the cord through and tie off the end with a single knot. Brace the pulley with one hand and pull the cord firmly to tighten the knot. Feed the other end of the cord through the center of the starter handle. Pull the cord and remove the screwdriver holding the pulley. Ease the cord in and allow the recoil spring to wind the pull cord around until the rope is slack. Pull the cord out by 6 inches to apply tension to the rope. Pull the starter handle along the cord until it rests against the housing. Secure the starter handle by tying a single overhand knot on the rope close to the outer edge of the handle. Cut the cord an inch from the knot and seal the end with a match or cigarette lighter. Test the recoil action by pulling the starter handle out once or twice. Remove dust and debris from inside the engine pulley with a few blasts of compressed air. Replace the recoil starter and insert and tighten the bolts. Start the mower to test the pull cord action to test your new pull cord.